Here is my confessional for the day, ehem, year. Heck, this one is so good it might be good for a decade! 2. My sister was right. Actually, number 2 might last me a lifetime! Here's how it all started. Yesterday, I found a recipe in Kathryn Tucker Windham's, Treasured Alabama Recipes, cookbook. 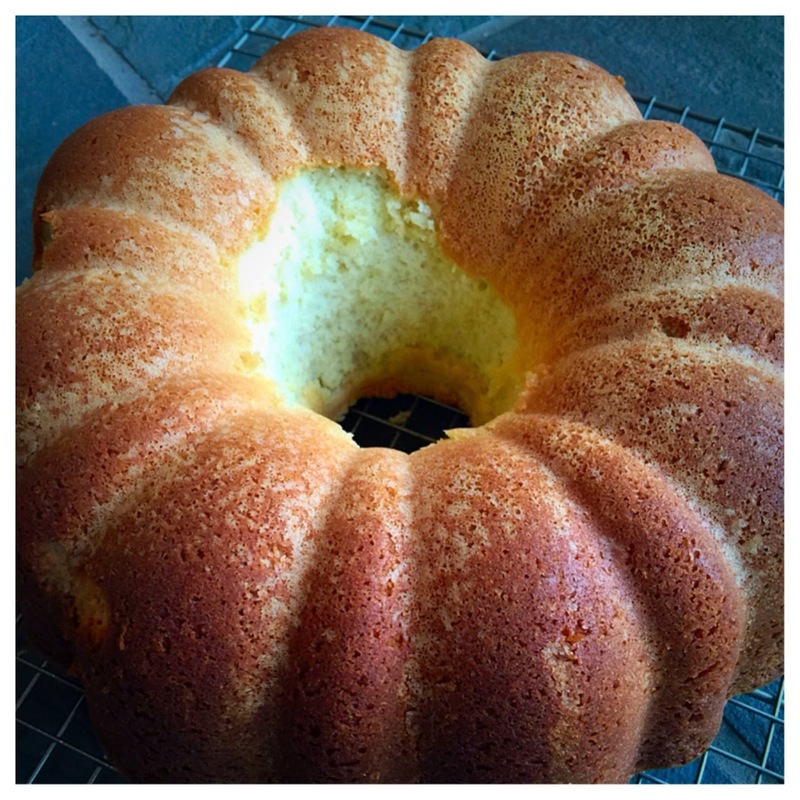 The recipe was called Scottsboro Pound Cake. I have lived in Scottsboro most of my adult life and not once has anyone said anything about Scottsboro Pound Cake. So, being, well, nosy, I just had to give the recipe a try. It wasn't until I started pulling out the ingredients that I realized this recipe was missing some things. First there were no leavening ingredients in the recipe. I was confused. To make matters worse, there was no liquid. I was beginning to think that Kathryn Tucker Windham might have made...alright, I was SURE she HAD made a mistake in writing this recipe. It made me feel a little bit better about the editing errors I have found in my family's own cookbook. Anyway, as I was coming to this realization, my sister called. Let me preface this by saying, in my defense, my sister does not cook. She said she had been doing a little more cooking lately, but basically, she has not been very interested in cooking. Anyway, she asked what I was doing. I told her and proceeded to explain that Ms. Windham had made some mistakes in her recipe and that I was correcting them by adding baking powder, salt and milk. My sister, in her naivety or lack of experience, or inherent bossiness, said perhaps I should bake the cake as it was written before I started changing things up. I pooh poohed this idea (and I might have rolled my eyes), because nobody in their right mind would make a cake that was not going to rise! We talked some more, ended our chat and I went on about my cake making business. I should mention, at this point, that I accidentally left out one of the sticks of butter, which would definitely make a difference in the outcome! After I got the cake in the oven, I was looking through some of the pound cake recipes in my family's cookbook and noticed one that my sister -in-law had contributed to the book. 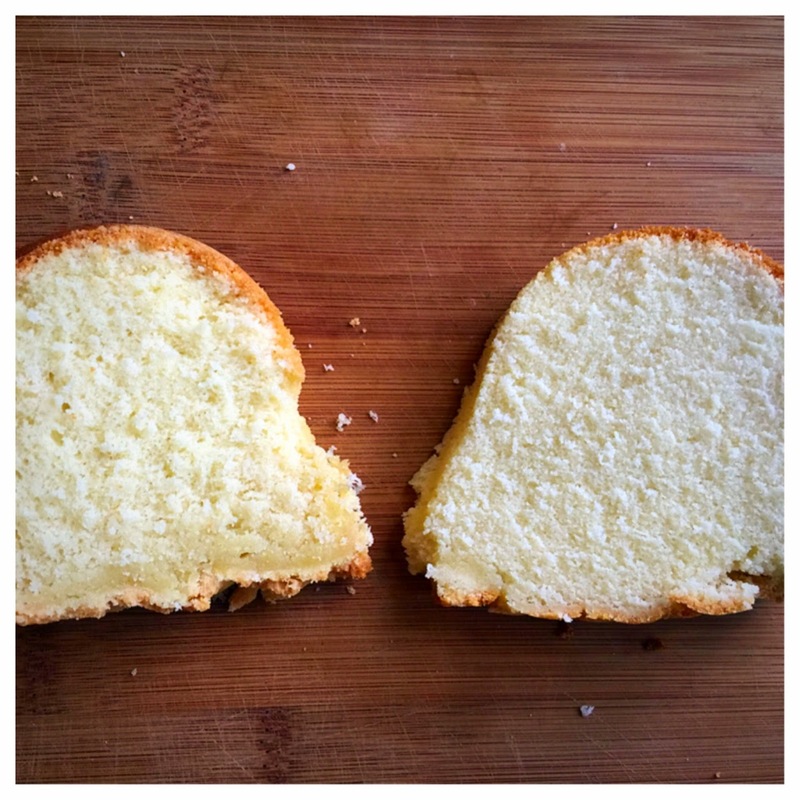 It was a recipe for cream cheese pound cake and lo, and behold...no leavening, no liquid! I sent a quick text to her to ask if she had made a mistake in typing up the recipe and she said the recipe was correct, there was no mistake. Ok! That sure got me to thinking, so I did a little of what we used to call research, but now we just call it googling. That is when I found an article about pound cakes, how they originated and what ingredients were in the original pound cakes. It turns out. pound cakes originally had four ingredients: butter, sugar, eggs and flour. No liquid! No leavening! Back in the early 1700's, when many people could not read, this was a simple recipe for them to remember. Also, it turns out, it was a good cake to make because people did not have access to many leavening ingredients. Wow! You know what that meant! I had to go back and do what my sister had so nonchalantly suggested and make the recipe as written. Now I am sitting here with two pound cakes on my counter. One of them lighter and fluffier and more buttery. The other one is delicious, but not AS delicious. So which is which? The Scottsboro Pound Cake is much better than my corrected version. Who knew that a cake could be light and moist and not heavy or dense without any leavening ingredients of any kind! Who knew I could be so wrong and my sister could be so right! My "corrected' cake with leavening and liquid ingredients added, but minus one stick of butter. It looks good and it is good! 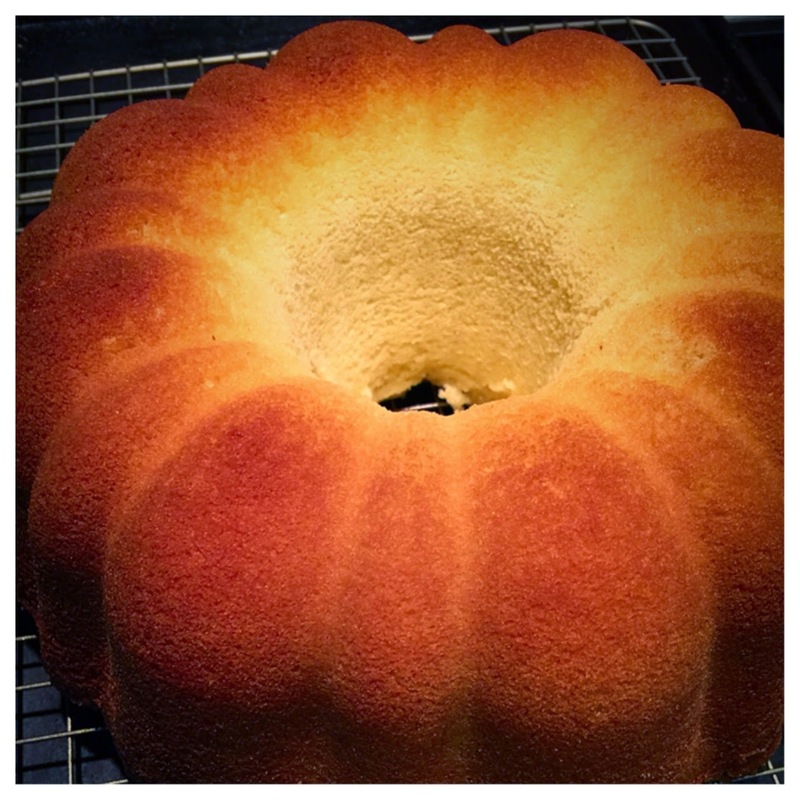 The pound cake baked "as written" by Kathryn Tucker Windham. It looks good and it was BETTER than my corrected version! Here are the two cakes, sliced. The one on the left is the original and the one on the right is my fiddled with version. As you can see the original has more texture. Mine looks smooth, like it would be more moist, but it isn't. You can also tell how much more buttery the original is than mine. I don't know who the Scottsboro person was who gave this recipe to Kathryn Tucker, but they knew what they were doing. I'm not even sure if this was truly a Scottsboro invention, but I think we will try to lay claim to it anyway! After all, Kathryn Tucker Windham said it was so! Here's the recipe, with a few tips by me, because I still cannot leave well enough alone! Preheat oven to 325 degrees. Cream butter and sugar until light and fluffy. This will take about 5 minutes and this step is crucial. Add vanilla flavoring and do not even think about adding imitation vanilla flavoring! Sift flour into a separate bowl. Add eggs to sugar and butter mixture one at a time, alternating with flour in 1/2 cup increments, beginning with an egg and ending with flour. Pour into a well greased and floured bundt pan. I found that this cake was more likely to stick, so lubricate that pan well. Bake for 1 hour and 15 minutes or until a pick inserted into the center of the cake comes out clean. You should learn to listen to your sister, Richi. She is a smart girl! I love that! Great story. And that cake looks wonderful. Both of them.